A couple of happy accidents worked out in this sessions favor. First off the attendee breakdown was about as perfect as I could have asked for. When we started we had five attendees, two from Translation Service Providers, two from translation clients and one from an organization focused on technologies for the translation space. A sixth attendee, a freelance translator, joined later. This meant we had each of the main components of the content lifecycle represented. Secondly none of the attendees were experts at systems integration which prevent shortcutting the process by having one persons answers or ideas dominate the conversations. My goal with the session was to start with a very broad brainstorming question where the attendees would generate post-its representing every step they could think of in the content lifecycle and then distill those steps down and add additional layers of information as we went. 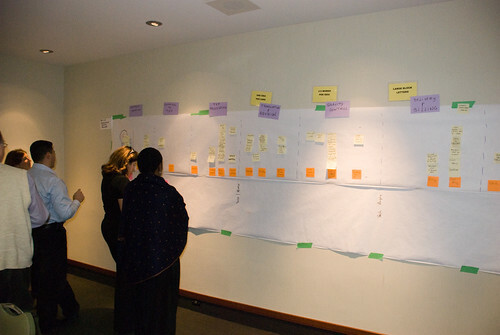 After the first brainstorming session we arranged the post-its on a timeline that was approximately 18ft across on the wall of the room. Even at this early stage it was quickly discovered just how different the industry vocabulary is, even amongst the five people in the room. Many post-its conveyed the same idea in very different ways. The process itself was also up for a lot of debate – while everyone did most of the steps, the order was a point of contention in several places. 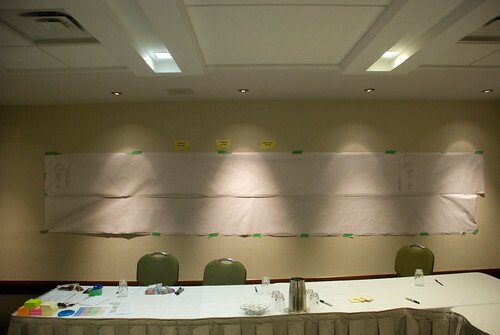 At this point we did another pass of the process to stretch the timeline across the wall and work through the positioning of the post-its in sequential order. Once this was complete I gave the group a stack of large index cards that had non-descript symbols on them and asked them to define the major stages of the process. One the major stages were defined we went back and named each stage. 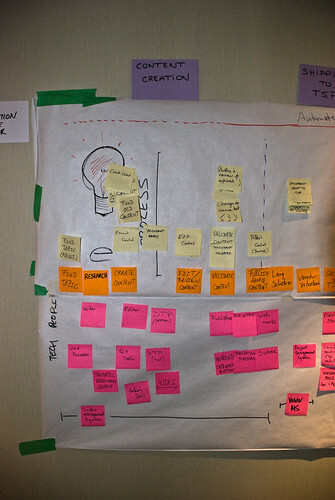 Now that we had the major stages identified and defined it was time to turn our focus back on the post-its from the brainstorming. I asked the group to start creating clear, concise names for each step that the post-its represented – eliminating duplicates but honoring the diversity of the ideas. In the interest of time, I split the group in to two groups of three (our sixth person had arrived at this point) and had them work form opposite ends of the timeline towards the middle. To visually differentiate the steps I had the group use bright orange post-its and had them arrange them in a linear fashion. At this point we had the basic lifecycle process defined and laid out in a linear fashion. Based on the process we had defined I now asked the group to brainstorm what people (roles) were involved at each step and what technologies or tools would be used to accomplish each step. Again, to keep things clear I asked the group to use a third colour of post-it, this time bright pink for this new information. 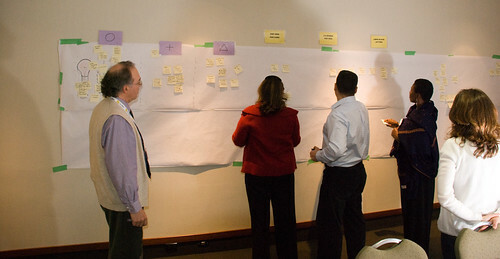 Once again, I had the group place their post-its on the wall below the corresponding tasks – layering people immediately under the orange timeline and then technologies beneath it. At this point time was beginning to run a bit short so we switched to a conversation format where we discussed what was learned, discovered and how to move forward. 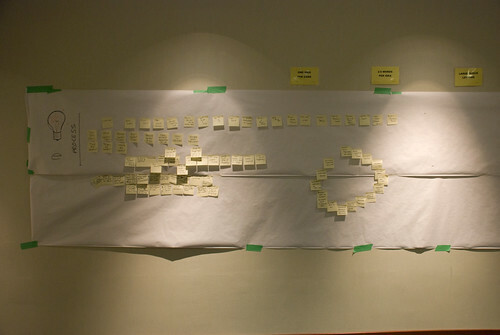 For a couple of people in the room I think this process opened their eyes to the true complexity of the process. 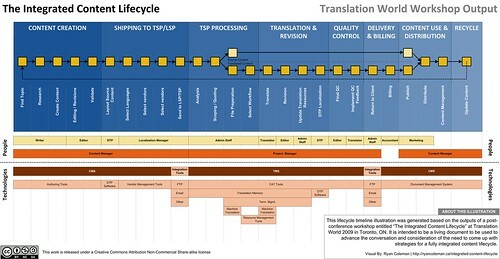 One major observation was the fact that “Translation” as a task itself was just one post-it in this entire lifecycle and that many people don’t give much thought to the complexity of getting content to and from that step. Much of the conversation was also focused on helping the attendees better understand the technologies at work in the background, what integration/automation opportunities existed, and what challenges they might face. Overall anecdotal feedback from the session has been positive. Below is the visual output I created based on the artifacts generated during the session – You can view it in PDF form here.